As promised, this week is Spring Fashion Week around A Foreign Land. Yesterday, the handsome hubby and I caught a few moments between rain clouds to snap a shot of outfit number 1 at Renaissance Park. 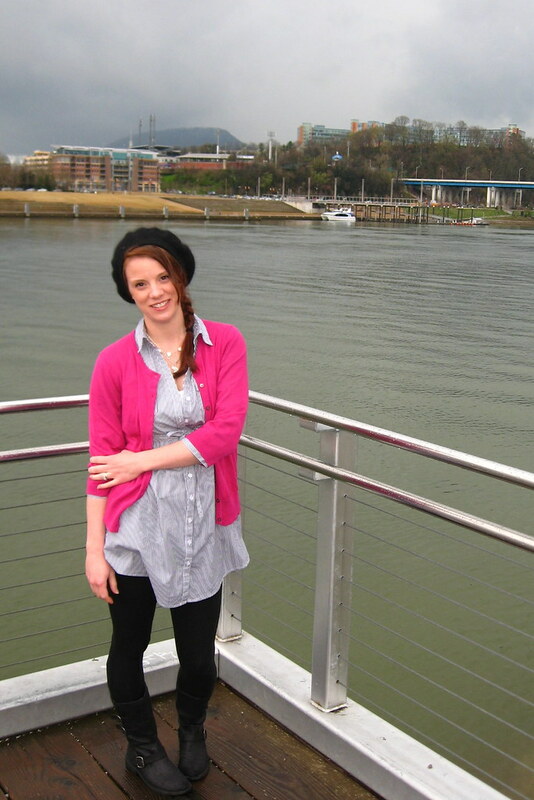 Thought I'd share not only my outfit but a taste of our newest discovery in Chattanooga. Drum roll please, THE PARK IS DOG FRIENDLY!!! WOO HOO. *My cardi and white cami are from Old Navy. *The hat I bought with my sister in law in "the" mall somewhere… but I can’t remember where. Vicki? Do you remember? *The boots are my current FAVORITES and I’m trying to figure out how to transition them to my Spring wardrobe. I can wear black boots in the Spring, right?!?! Good, because I wear them constantly. I got them on Amazon around Christmas and the tags say Rocket Dog. *The necklaces, which I love, are completely lost in this shot. Unfortunately, I don’t have a fancy dancy camera to get the detail (though I tried below) and do them justice. 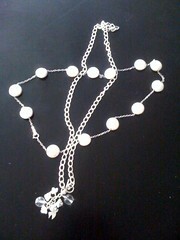 But, the salt water pearls were a gift from my Pops several years ago when he went to the Bahamas. They are a great “go to” piece. I’m also wearing a super fun necklace which was a Christmas gift from my way-more-stylish-than-me cousin, Amie. She tells me that you can browse other cute pieces (I guess mine's one of kind) in Clare Etheridge's portfolio here. Funny thing, yesterday when we started taking pictures I got all shy in front of the camera! HUH?!?!? Hopefully, the awkwardness will wear off and I’ll loosen up a bit! Otherwise, there’s just no future for me in blog fashion modeling. For more fun, FASHION moments check out the EPICENTER of Spring Fashion Week here. You are so cute!! I love that hat on you, and I say YES to the black boots for Spring-- with some 90's floral rompers and a light denim jacket and your hair up in a knot bun on the top of your head, you'd look killer! Your hat is ADORABLE. I am so self concious about hats, I always end up taking them off cause I think they look weird. Props to you for wearing (and looking great in) leggings! love the hat girl! Super cute. and that pop of color in your sweater is very nice! I love the hat AND the boots. I wish I had black boots like those!! Sorry...just got to this blog. Pretty sure we scored the hats from Charlotte Russe.